SOAHA Hockey Exhibition, 2:30 p.m.
Early-bird, family-friendly, discount skate, 5 to 7 p.m. Figure Skating Performance, 7 p.m.
Live DJ during Rec Skate, 7:30 to 10 p.m.
Our friendly mascot, Chilly the Snowman & Friends… Ho Ho Ho!! Toys for Tots will be on-site – Bring your NEW, unwrapped toy. Later in December, Coordinators for Toys for Tots will sort by age and gender, and with the assistance of local social welfare agencies, distribute the toys to the less fortunate children of the Southern Oregon community. 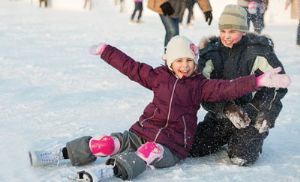 The ice rink, a division of Ashland Parks & Recreation Commission (APRC), is located at 95 Winburn Way, across from the Lithia Park playground, around the corner from the Plaza and at the corner of Nutley Street and Winburn Way. Our skate rentals accommodate toddler size 9-up to men’s size 15. Please come prepared to skate, as changing rooms are not available. Hot chocolate, coffee and a variety of snacks may be purchased onsite. The rink offers skate trainers during some sessions… available at no charge. The 2018-19 Season will feature something for everyone… Bring the whole family! For more information on prices, schedules, lessons, programming, hockey, scholarships and all we have to offer, visit AshlandParksandRec.org or call the ice rink directly at 541.488.9189. You may also call the APRC office at 541.488.5340.